ReView recordings can be added to any location within a Blackboard module, making it easy to share lecture recordings and personal captures/screencasts with your students. The guidance below will explain how to embed a video using the more advanced, Tools option. You may be required to change the Advanced Settings in your ReView library before using this option. 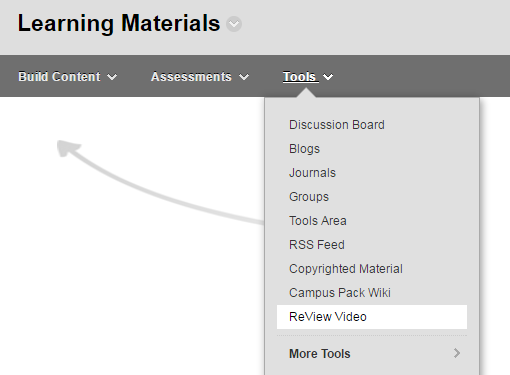 Use the Tools option to add a link (as shown below) when embedding a ReView recording in a Blackboard module. This link will open the full ReView player in a new browser window. PLEASE NOTE: If you have sub folders set up in your ReView Video Library, these will not be available to you by default in this Tools option. You will need to add the folders using the Advanced Setting in your ReView Video Library. Please follow step 1-3 below to add your sub folders. Open you ReView Video Library in your Blackboard module. If you have video recordings organised in sub folders, you will need to ‘associate’ or ‘attach’ these folders using the Advanced Settings in the ReView Video Library section. 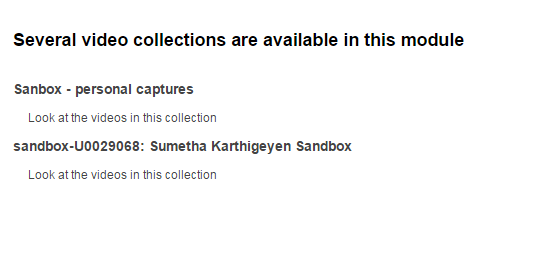 As an example, in order to add the ‘Sandbox – personal captures’ sub folder, click Change. This will take you to a page where you can select all available folders e.g. courses that you are a module leader. Select the appropriate sub folder. Click Add, then click Submit. 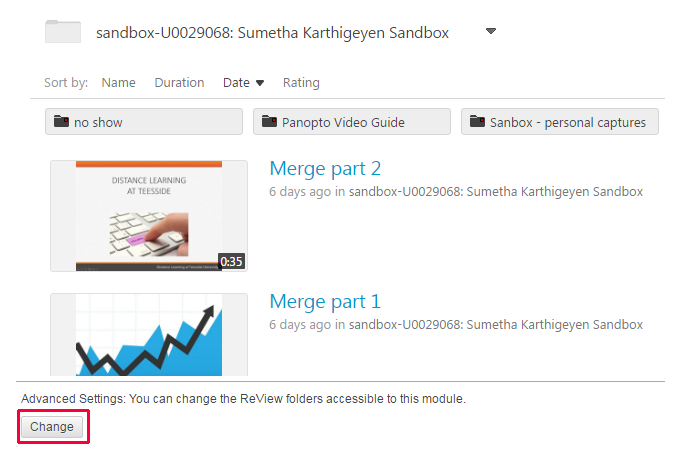 You will notice that, when more than one folder is associated to a module, the ReView Video Library interface will have textual links rather than thumbnail images. To add your ReView recording using the Tools option, go to the location where you want to add your recording e.g. a folder within your Learning Materials. From the top menu select Tools > ReView Video. Click on the Folder drop down list and select the appropriate folder. Click on the Lecture drop down list and select the name of the recording you want to add. Insert a title for the content item and a description if needed. You will now see a link to the ReView video. Click the link to watch the video on ReView player (opens a new window).